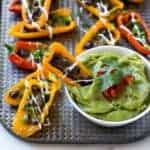 Mini bell pepper halves topped with black beans and melted cheese then drizzled with sour cream and finished off with jalapeno and cilantro. Serve with guacamole for dipping. Preheat the broiler. Place the pepper halves on a baking sheet lined with foil. Sprinkle the taco seasoning over the peppers. Divide the beans evenly among the pepper halves, then sprinkle on the cheese. Remove from oven. Drizzle the sour cream over the tops of the peppers. You can thin out your sour cream with 1/2 teaspoon of water if it's too thick to drizzle. Sprinkle the cilantro and jalapeno over the tops of the peppers. Serve immediately, with guacamole for dipping.